One morning last week I happened to look out the kitchen window just as a couple of our neighbors from the end of the street were passing by. They were clearly on the way to the market, rolling cart in tow, but stopped long enough for a quick chat. Francis told me that they were going to buy the ingredients for a choucroute that his wife, Isabelle, always made at this time of year. That word sounded familiar and it only took a minute to pull out an ad that we had saved from our favorite bistrot promoting their 10 euro/dollar plate of the day: Choucroute-charcutière. As you can see from the magazine advertisement, a hearty plate of sausages and sauerkraut awaits any diners willing to part with just 10 euros. While the photo looks tempting, it doesn’t reveal all of the ingredients of this dish that originated in northeastern France in Alsace, right next to the German border. A shopping list prepared by a national supermarket chain says that you will need to buy cabbage (or sauerkraut), potatoes, Strasbourg sausage, smoked sausage, bacon, garlic sausage, a pork knuckle, and other ham to taste. An accompanying recipe has you braise the cabbage in wine, boil the sausages and potatoes until tender, bake the remaining meats, and serve everything together as you see on this plate. I don’t suppose this is something we’ll serve to any vegetarian or vegan friends. Something else that Francis mentioned that caught my attention was when he said “at this time of year” since the supermarket ads all seem to be featuring exactly the same products: cheeses for melting and cured meats. 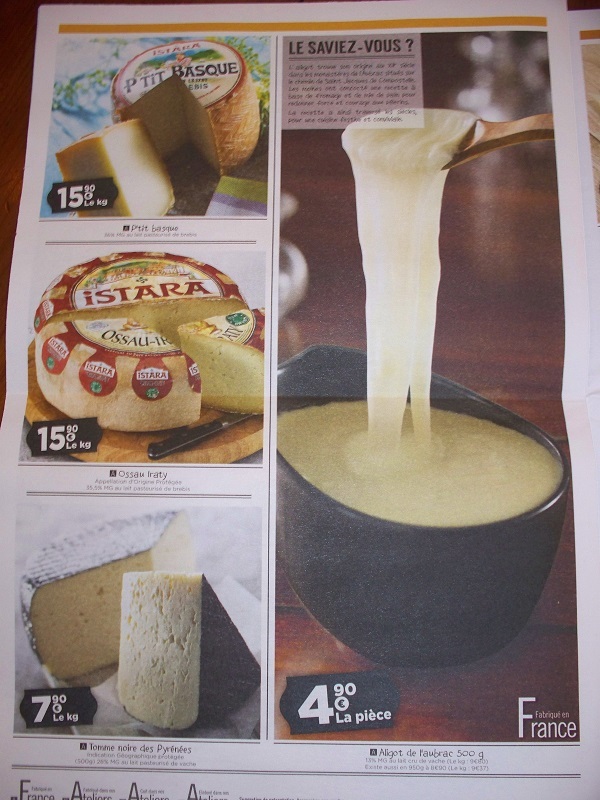 In a country with at least 400 different kinds of frommage, with names like Brie or Camembert that we all recognize, it’s certainly not unusual to see them featured but these promotions all have to do with melting the cheese. 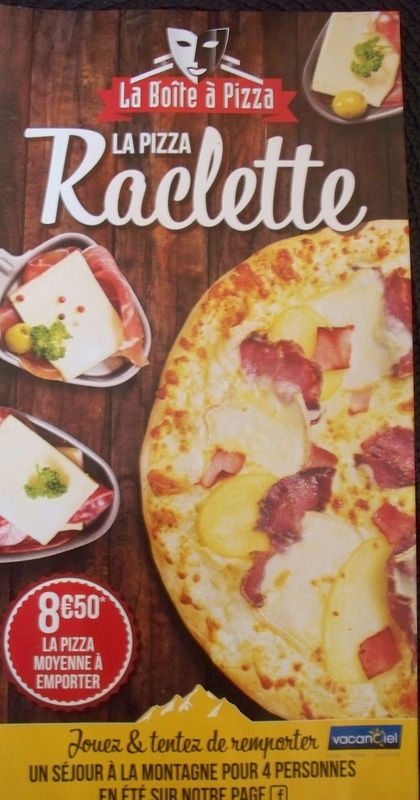 Even the pizza parlors get in on the act by selling a raclette version of their pie. 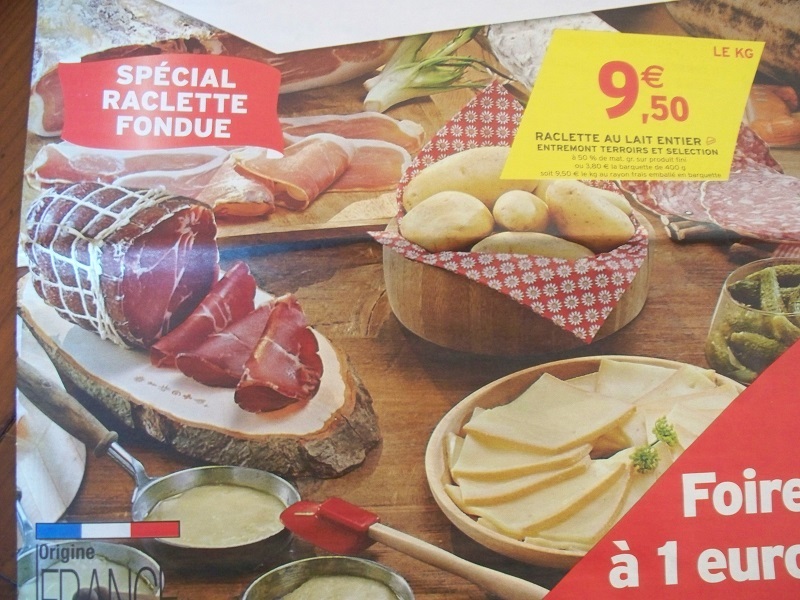 While we were familiar with dipping chunks of bread and sausages into fondue (that’s just the French word for “melted”) a raclette takes the opposite approach where you smother your plateful of cooked potatoes, sausages, and other cured meats with steaming, melted cheese. So, at this chilly time of year we have these warming comfort foods from northern France and from the Alps. I wonder what our region, here in the south that Bill and I think of as Wine Country can offer to accompany these meals? Let me get a glass of sparkling Blanquette de Limoux, made 30 minutes south of Carcassonne, to think about that. Posted on March 5, 2017, in Life in France and tagged Americans in Carcassonne, Food, Markets. Bookmark the permalink. 2 Comments. 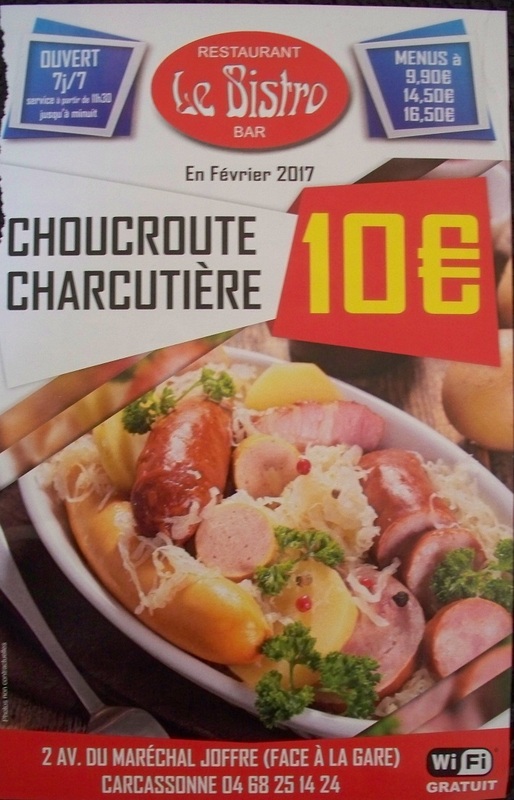 How funny, I was just thinking about a wonderful choucroute charcutiere I had in Montreux, Switzerland, years ago. Must be that time of year. No doubt this is a delightful dish for those who enjoy the various forms of pig meat, but your polite consideration for your vegetarian/vegan (and pescatarian) friends is appreciated! Lol!